Artist, teacher and entrepreneur, Joan Ng works in a variety of mediums including water colour, oil, acrylic, pastel, ink and screen printing. Since moving to Burlington in 1970, Joan's art has featured in eight solo shows and many group shows. She has been a member of the Burlington Fine Arts Association for over forty years and her work has been displayed at the Hamilton Art Gallery, the Burlington Art Centre, the Rivercrest Gallery, and the Royal Botanical Gardens, among others. 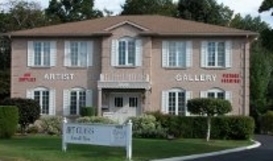 Educated in fine art at Sheridan College and the Dundas Valley School of Art, Joan began teaching children in 1972. She opened the Burlington Artist Gallery in 1976 and has taught classes at her Commerce Court location since 1987. Over the years her work has sold at auctions benefitting such charities as Halton Adolescent Support Services, Halton Women Place Centre, the United Way, and the Burlington Art Centre. In 1994, Joan established an ongoing scholarship fund for Sung Siew Secondary School, where Joan herself graduated, in Sandakan, Sabah, Malaysia. Joan’s art is collected all around the world. A wide selection of Joan’s original artwork is available to view and purchase at the Burlington Artist Gallery. Browse below for a sampling. Water colour, framed and matted.